If you have difficulty receiving from others, this will impede your giving. If you have difficulty giving, this will affect your receiving. Our self-worth impacts what we allow ourselves to be, do and have in life. Our self-worth impacts what we allow ourselves to be, to do and to have in life. This plays a vital role in fair exchange of services or goods. Fair exchange dependends on your perceptions of the offer and your hierarchy of values. People label you as open-minded and generous when you are receptive to an offer that supports your highest values. They label you as closed-minded and stingy when you are non-receptive to an offer that challenges your highest values. Often these labels are nothing more than projections based upon the few or many transactions someone may experience. When you perceive that you are being offered a product or service that is overpriced, you can become unwilling to engage in the unfair exchange. You can awaken a more proud and narcissistic tendency to retaliate back until the exchange is once again fair. Likewise, if you perceive that you are being offered a product or service that is under-priced then you can become unwilling to engage in the unfair exchange. This awakes a more shamed and altruistic tendency to negotiate back until the exchange is once again fair. But when you receive an offer for a product or service that is fairly priced, you would be willing to engage in a fair exchange. The Equity Theory explains that people innately prefer sustainable and equitable fair exchanges. People raise their narcissistic quotient and want to take more and give less when they have received less than what they feel they deserve. When someone receives more than what they feel deserve they tend to raise their altruistic quotient. They want to give more and take less. Both of these natural negative feedback tendencies help initiate a fair exchange. These two natural tendencies are innate mechanisms that sustain equitable relations and confer evolutionary advantage. Over time these oscillating tendencies balance out so someone is neither a giver nor a taker, but actually both. When someone with their subjective bias labels another person more of a “giver” or a “taker” they simply have not looked long enough to see the equity that is present. Nature equilibrates any misperceived imbalances through time. When we factor all transactions in someone’s socioeconomic network the equitable fair exchange is synchronously present. But the variables may be at times too complex to see this balance and therefore lopsided labels can emerge. You as a mini universe are no different to the greater universe. Any time you imagine yourself giving something for nothing or getting something for nothing, you temporarily raise or lower your perceived self-esteem. These elevated and depressed self-esteems oscillate around a mean called you true self-worth. The more stable and centered your self-esteem oscillations are the more elevated your self-worth becomes. Your self-worth is directly proportionate to how well you can fairly equalise or equilibrate what you give and take. The more you give what others love and receive, the more fulfilling your life becomes. When you give service, it’s certainly wiser and more fulfilling to give the service you love and love the service you give. Likewise, when you receive rewards, it’s wiser and more fulfilling to receive the reward you love and love the reward you receive. 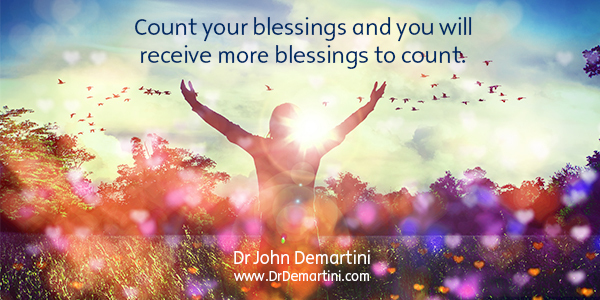 If you’d love to learn more about building wealth through fair exchange consider Dr Demartini’s online learning program: Building Inspired Wealth.